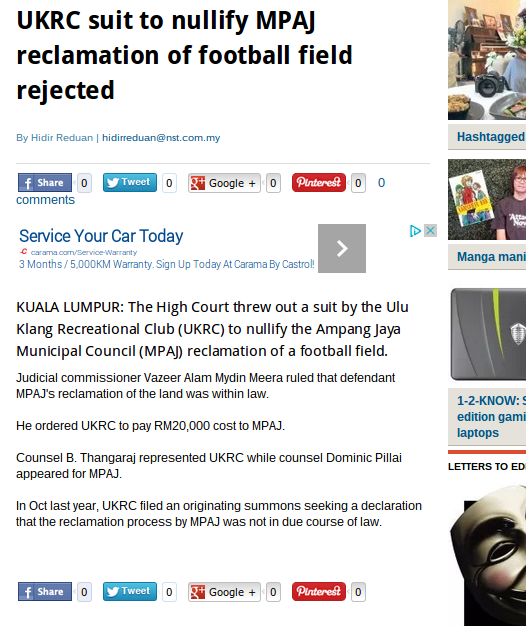 I hope the good, ordinary people of Ulu Klang Recreation Club files an appeal. How the learned judge found it perfectly okay for a local council to walk into a private club and reclaim the football field the club has maintained - not for a year or two but for generations - beats me! The UKRC has not only kept the field green and lively, it has staved off greedy developers who wanted to "develop" the piece of land for years. What's stopping the local government from developing a quarter or half of the field for condos? What's stopping MPAJ from walking into other clubs and seizing their field and golf courses? I hope the MPAJ sues the government and seek compensation for the millions of ringgit the club had spent taking care of a field that they had been made to think was theirs. I think the legality argument is based on eminent domain. Obviously can't comment much without having a peek of the verdict transcript. Field of joy or rather 'Feel of joy' in your headline Rocky. Or you rather just wanted to sound phonetically similar to the former as to reflect subject matter of your piece here. I share your disappointments together with the other UKRC members. Land, like religion and Malay customs is a state matter Rocky. There's nothing much you can do. The state government will always have an upper hand no matter where you wanted to bring your case. You're up against the undisputed owner who had a formidable arsenals at their disposal in the form of clauses and provisions spelled and stated in the constitution, in KTN, in MTN which favoured them. You guys are fighting a losing battle. if you are baffled dato', read the judgment. if you are still baffled, seek a competent legal counsel who will explain the law made by parliament that provides for such action. judges only interpret the law made by legislators chosen by the rakyat. The judge knows better msybe. The Land title names the MPAJ as owner of the land? Maybe the judge thinks that taking care and maintaining a field does not automatically gives one the ownership of the land? Topic Ni Dah Basi Bro! Just look at ampang, gombak, selayang, pj..
Overdevelopment for multilevel condominiums? Yes. The entire place is serabai. Traffic is madness, surely residential development had never considered the road flows appropriately. The inspectors must have come on an early Sunday or wee hours during a weekday. Or blatantly recommend and approve. So sick of the town planning, whoever in charge should be ashame of yourself. You are answerable to God, and many people. Greedy and questionable lot - you are a disgrace.i hope whatever moneies that they make out of this will dissapear quickly. national land code 101 revisit...whatever structures or anything that erected on piece of land that is legally belong to a landowner will always belong to the rightful landowner no matter how big someone had spent. lesson no. 1: don't plant a tree on other people land as fruits will finally be enjoyed by others. UKRC should continue to fight for justice, more so when they have spent a lot of money up keeping the field of joy. Saari Sungib is the mother of all evil. Lied to UKRC and made use of UKRC members to gain support. Datuk, I suggest we start a fund to help UKRC pay the cost to MPAJ as awarded by the court and more better if corporate companies could come forward and donate to help UKRC to buy a land. They way Pakatan Rakyat and Saari Sungib cheated and gave false hope to UKRC is really shameful and blatant lie to UKRC supporters and members. I am contribute RM100 Datuk. Zahid to Tian Chua: Don't push it! Petronas biggest loser in Iran over Shia' remark? So, what's wrong with BR1M?